Texas Transportation Commissioner Tryon Lewis and State Rep. Drew Darby led a gathering of county, state and transportation officials in a rail spike-driving event today to commemorate federally-funded projects to rebuild 90.8 mi. of track on the South Orient Rail Line in West Texas. The event held at the San Angelo Railway Museum was punctuated by putting hammer to a golden spike to celebrate the improvements funded through the Federal Highway Administration's (FHWA) National Highway Freight Network. The projects include a $5.4 million rehabilitation of 53.4 mi. of track in Irion and Reagan counties and a $4.1 million rehabilitation of 37.4 mi. of track in Crane and Upton counties. These projects are in addition to a $7 million rehabilitation of 72 mi. of track from the Texas-Mexico border to Alpine funded by a federal FASTLANE grant. Work also is planned to reconstruct the Presidio-Ojinaga International Rail Bridge destroyed by fire in 2008. The bridge, one of five border rail crossings between Texas and Mexico, has remained closed. The $9.2 million cost of construction for the new bridge is being provided by Texas Pacifico Transportation Ltd., operators of the state-owned rail line. Investment in the line comes when yearly carload counts have increased by nearly 300 percent over the past five years and 2017 is expected to be a record year. Commissioner Lewis called the improvements on the freight line, which supports the agriculture and oil and gas industry in the region, an important investment in the vitality of the West Texas economy. Speaking at the event, he thanked U.S. Sen. John Cornyn, Congressmen Will Hurd of San Antonio and Michael Conaway of Midland, Rep. Darby and other officials for their support in attaining the funds to improve the safety and efficiency of the railroad and reconstruct the bridge. 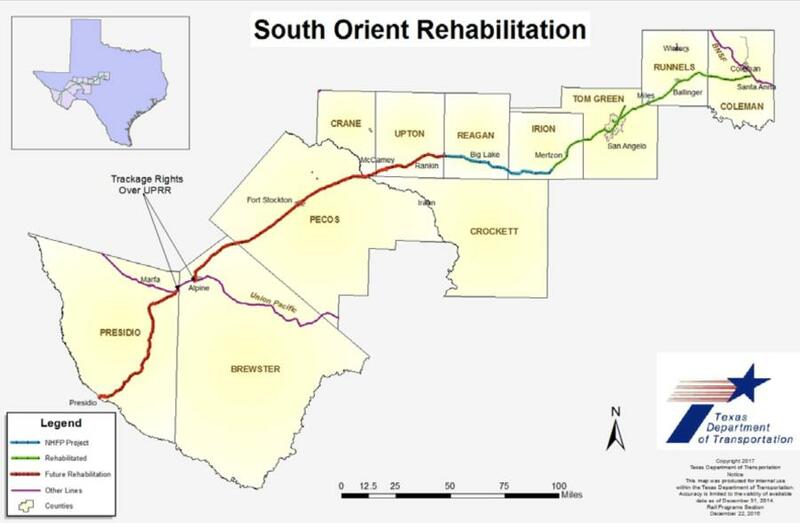 “The improvements that are being made to the rail line and the reconstruction of the rail bridge will provide future support for the communities and industries in Texas that rely on deliveries provided by the South Orient Railroad,” Commissioner Lewis said. The South Orient Rail Line runs 391 mi. from the Texas-Mexico border at Presidio through San Angelo to just south of Coleman. The line is owned by the state of Texas but maintained and operated by Texas Pacifico Transportation Ltd. under a lease with TxDOT.